These awards recognize the organizations that are simplifying their strategies, innovating, and delivering excellent customer experiences while achieving quantifiable results. With much more sales strategy as well as trading more license as a part of the Volume Partner criteria especially in gulf state and Saudi Arabia 4i have achieved the prestigious Volume Partner award.The Oracle Volume Partner Awards celebrate the wins, honor the achievements, and inspire to achieve even greater success in the future. 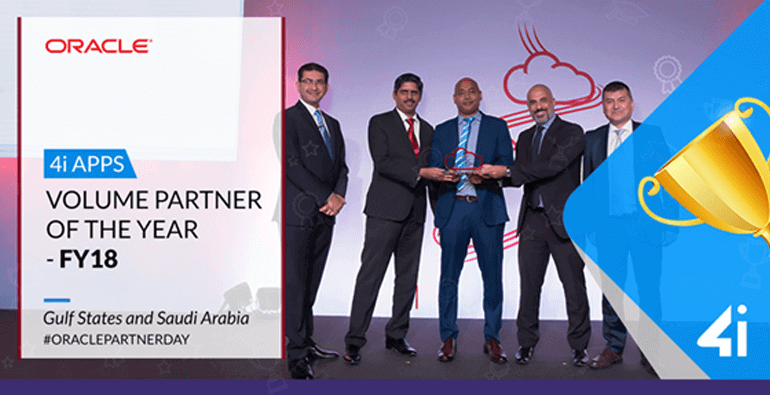 As a result of the evaluation of partner nominations for the “Volume Partner of the Year – FY18” award category, 4i Solutions has been selected by Oracle as the winning partner for the Gulf States and Saudi Arabia region. 4i Ranked Number 495 Fastest Growing Technology Company on the Deloitte Technology Fast 500™ Asia Pacific 2017.